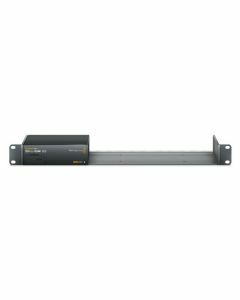 Rack Mount up to 3 Blackmagic Design Teranex Mini's side by side with this lightweight, 1 RU shelf that's perfect for road cases or equipment racks. Blackmagic Design Teranex Mini's are designed to be racked side by side, with three converters fitting in 1 RU, six in 2 RU and nine in 3 RU. When multiple units are racked side by side, variable speed fans pull from one unit into the next to facilitate optimal air flow. If a fan fails adjacent Teranex Mini will increase fan speed, to prevent overheating. Because they're small and lightweight you can even mount them in the rear of a rack or road case.